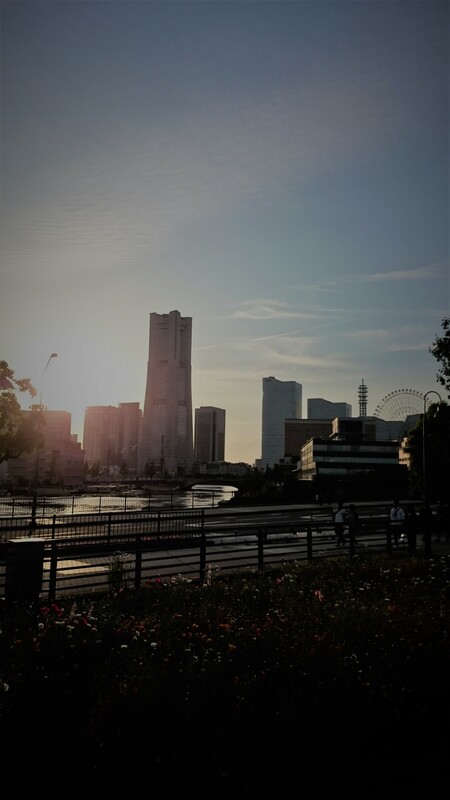 I don’t think I’ve mentioned Landmark Tower on this blog before, although I see a glimpse of it almost everyday from our balcony. 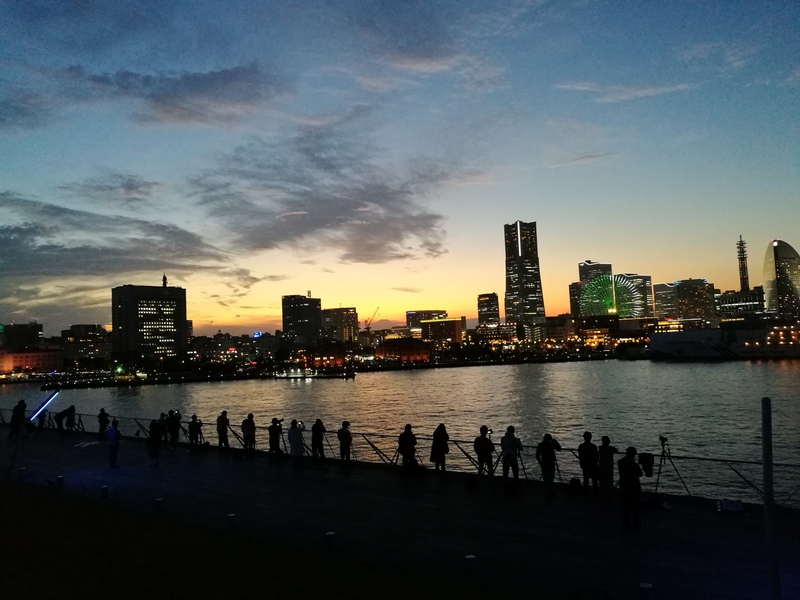 As the name suggests, it’s an icon of Yokohama and a key feature of the skyline. 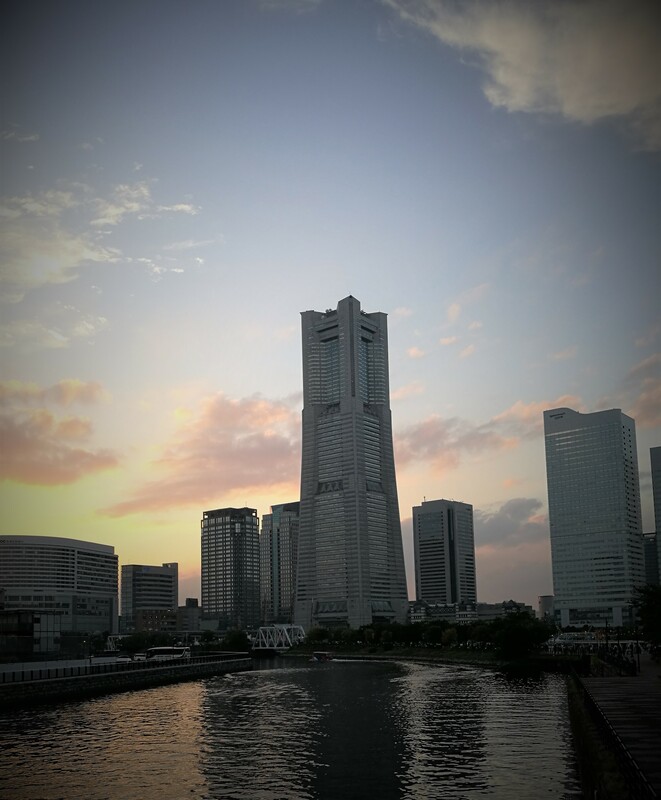 According to the Wikipedia entry, the tower is 296.3 m (972 ft) high, which makes it the second tallest building in Japan after Abeno Harukas in Osaka. Tokyo Skytree and Tokyo Tower are both also taller, but technically they’re antennae rather than “buildings”. 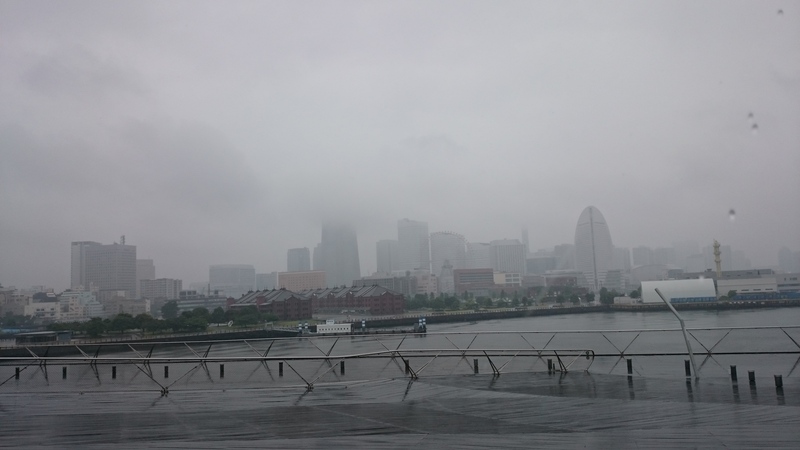 On rainy days in Yokohama, the top of the tower disappears into the clouds. Quoting Wikipedia again, “The building contains a five-star hotel which occupies floors 49-70, with 603 rooms in total. 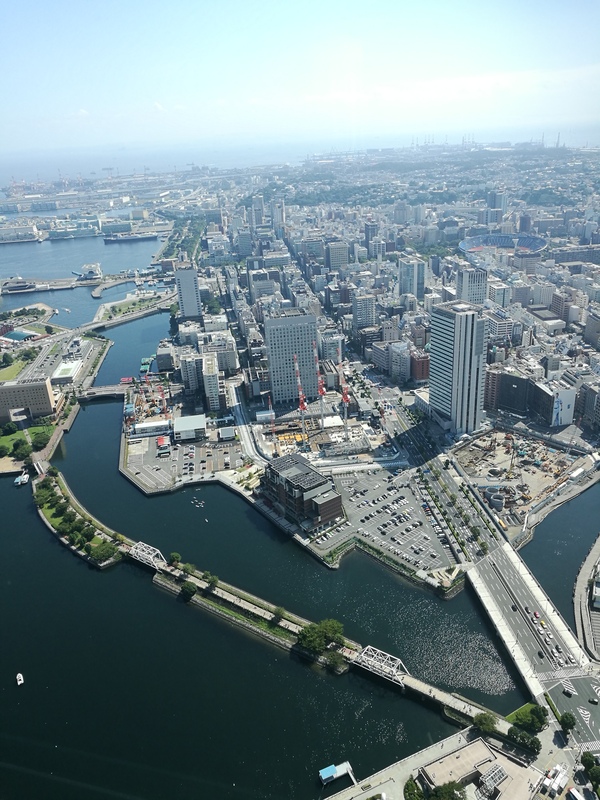 The lower 48 floors contain shops, restaurants, clinics, and offices.” And, “on the 69th floor there is an observatory, Sky Garden, from which one can see a 360-degree view of the city, and on clear days Mount Fuji. I’ve never actually been to this restaurant, but the name, サロン ウフ エ モア / Salon oeuf et moi (or “egg and me” in English), just tickles my fancy as faux français. Apparently it specializes in omelets and pancakes—Japanese-style, that is. The menu seems to have オムライス (omurice), which is a much-beloved dish consisting of, you guessed it, an omelet with rice inside. 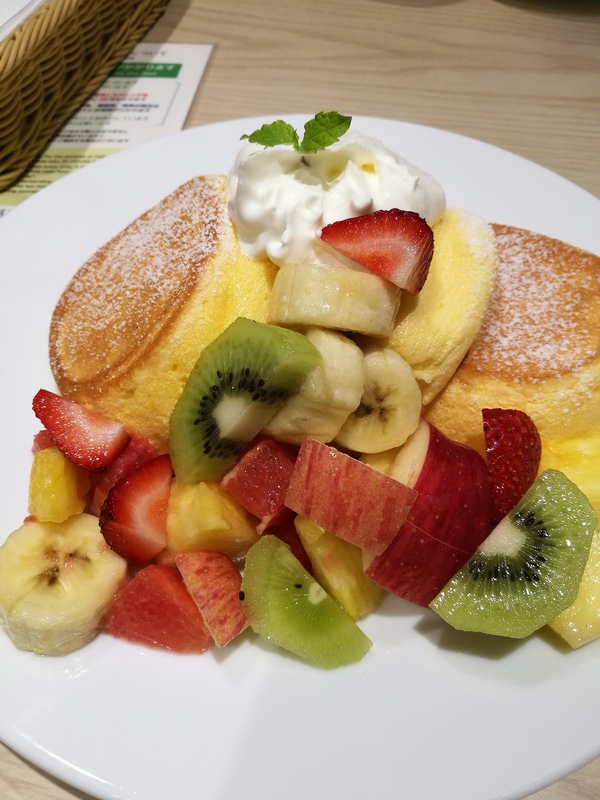 In terms of pancakes, super-thick airy pancakes are all the rage in Japan at the moment, in the manner of those shown below, from a different restaurant, 幸せのパンケーキ (Shiawase no pankeki / Happy Pancake). This is very random, but I quite liked the decor at an izakaya in Tokyo that we visited a while back. We entered the izakaya in search of dinner fairly early in the evening, but unfortunately there was already a chain smoker ensconced at the bar in the main area. We asked if there was another section, and the server / proprietress rather grudgingly took us to the back room, which I think she hadn’t intend to open yet. I’m glad she did, because in addition to having to deal with less stink, we got to eat with this delightful samurai-armored figure looking down on us. The walls also had pretty much every other traditional Japanese knick knack, including tanuki (“raccoon dog” is the usual translation) and maneki neko (lucky cat). 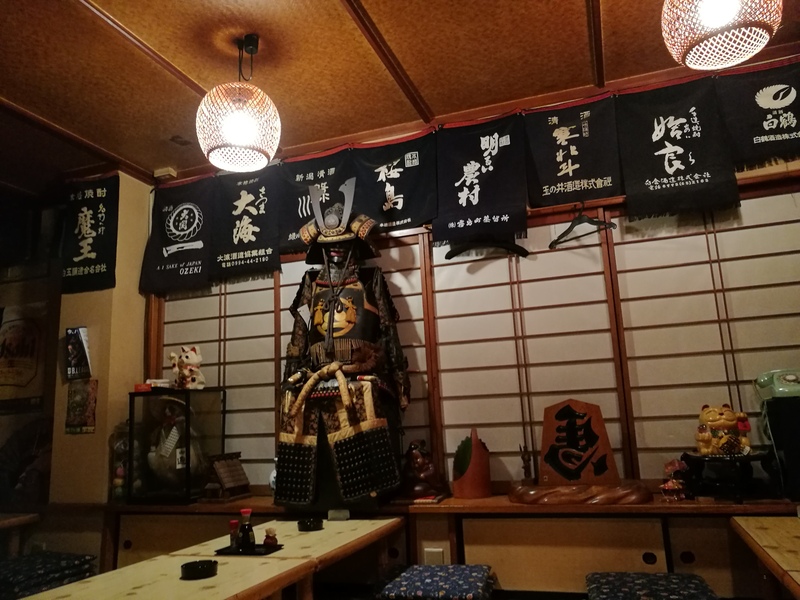 The banners on the wall are for different brands of Japanese alcohol (nihonshu and shochu). Our local police station has an informative sign that displays running totals of traffic accidents. 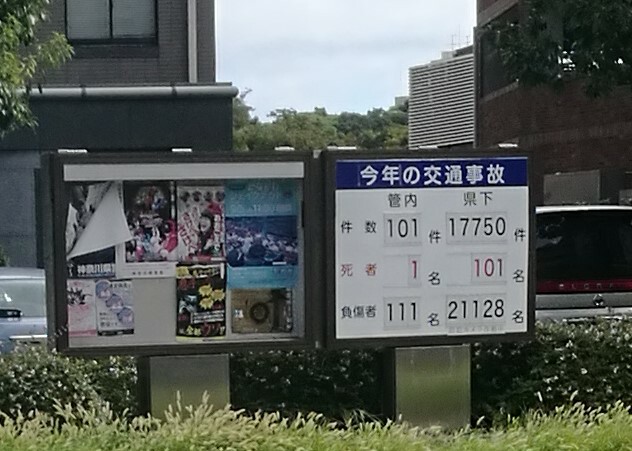 The first column has the figures for the station’s jurisdiction, while the second shows totals for the entire prefecture. From top to bottom, the numbers are incidents, deaths, and injuries for the year to date. For reference, the population of our prefecture (Kanagawa) is about 9 million people. This article from Japan for Sustainability notes that while overall traffic fatalities in Japan are low compared to many other countries, the proportion of pedestrians and cyclists killed is worrying. Over half of incidents also involve elderly people (over 65), which sort of makes sense given Japan’s aging population, but it also highlights another area that needs to be addressed. Maybe I’m just a busybody, but I’m often concerned (appalled) by a lack of basic safety especially with regard to kids. I frequently see kids in cars without car seats, or loaded onto to the popular mamachari bikes without helmets or proper belting-in. Don’t get me wrong, I think it’s awesome that so many people (i.e., women) transport their kids by bike, but those heavily-laden bikes are quite unwieldy and potentially dangerous if used with just a bit of carelessness. Not to mention the people who cycle while smoking, texting, or sheltering under large umbrellas… Eek! As a non-meat eater, I will never visit this neighbourhood restaurant, but I do appreciate the clarity with which it states its focus. 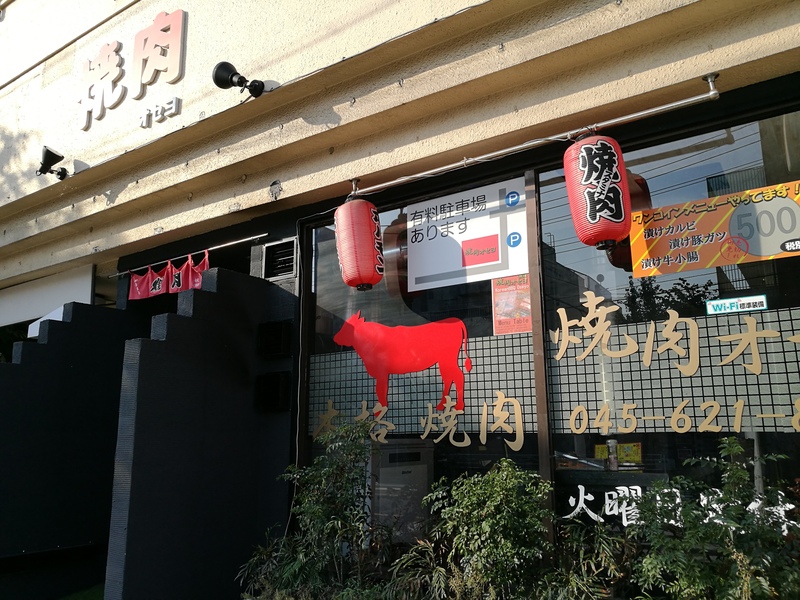 It’s a 焼肉 (yakiniku) or grilled meat restaurant, which is noted about 20 times on the building, plus the cow image if you weren’t quite sure! I make Japanese(ish) food pretty much everyday, but I’m far from being an expert. However, one thing that I’m quite familiar with is the set of five foundational seasonings. “These five seasonings are sugar (sato), salt (shio), vinegar (su), soy sauce (shoyu*), and miso (the second syllable gives us “so”). These seasonings can be used individually, but they are frequently used in tandem (possibly without miso) to create a true “Japanese” taste. The other most essential flavourings in Japanese cuisine are sake, mirin (a sweet cooking rice wine), and dashi (often made from bonito (tuna), mushrooms, or konbu seaweed). 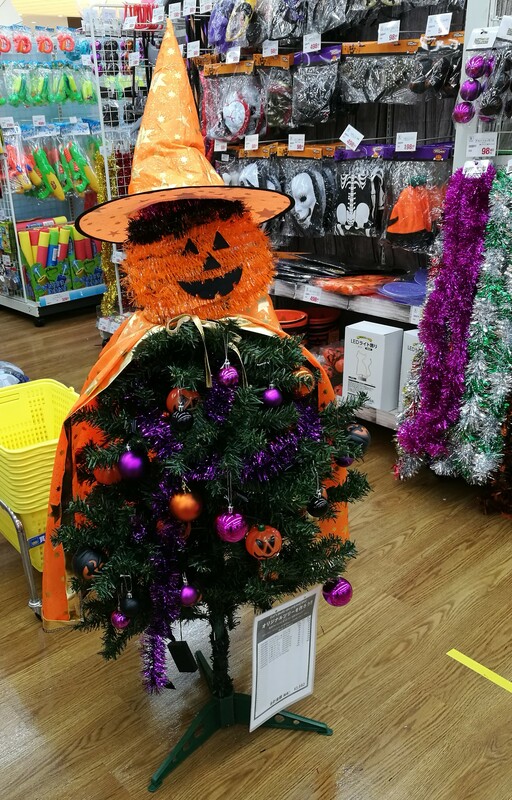 Spotted in a housewares store: this is the first time I’ve ever seen a Halloween tree. I surmise that the point, from a marketing perspective, is to combine the two most popular “American” holidays. Christmas has been popular in Japan for quite a while, but Halloween has vastly increased in merchandising in recent years. 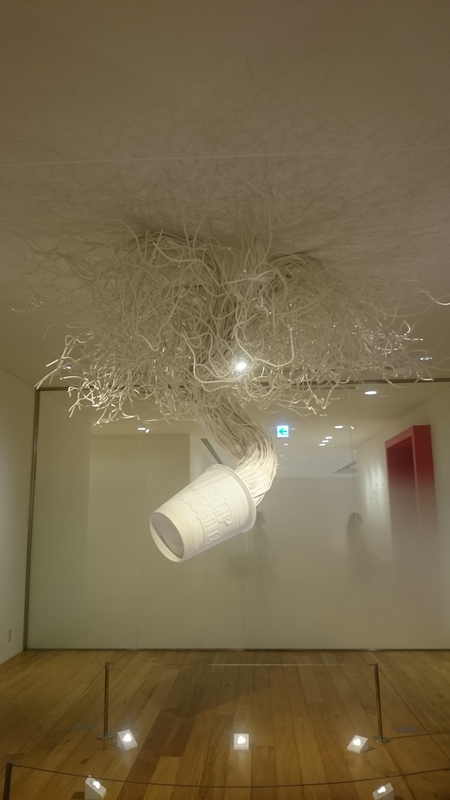 Over a year ago, a friend and I visited one of Yokohama’s most popular tourist attractions: the Cup Noodles Museum. The museum is dedicated to Momofuku Ando, the founder of Nissin Foods and inventor of instant ramen. 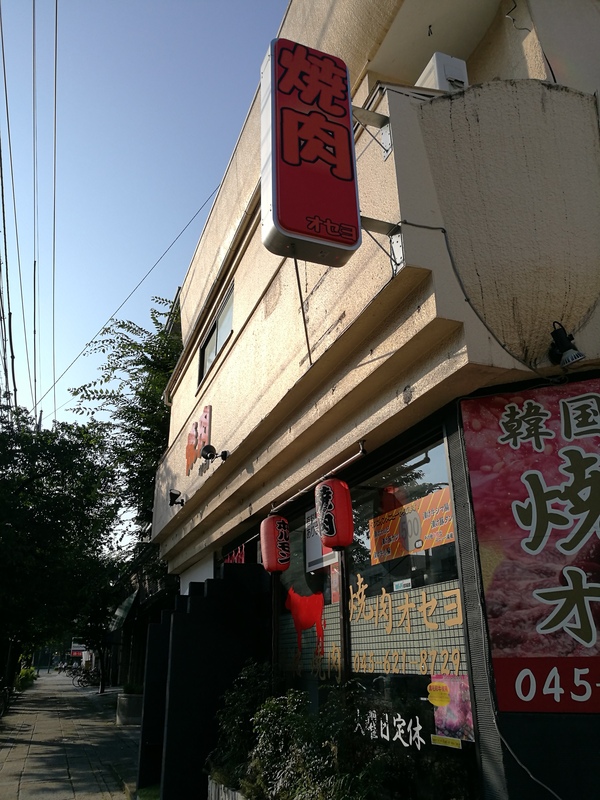 It’s a relatively small and kid-oriented spot, although instant ramen aficionados in particular will also find it fun. One room displays instant ramen packaging through the ages, from the 1950s to the present. I didn’t take any photos, but there is also a mock-up of Ando’s rustic kitchen where his experiments led to the creation of a viable instant ramen. A large part of the museum is a timeline painted on the wall (with very creative illustrations!) that explains the development of instant ramen and cup noodles. The overarching message or theme of the whole place is to encourage both dedication and creative thinking with the aim of changing the world. The main points of the timeline are in English, but the fuller explanations are in Japanese only. When I visited, I had recently read an article about Ando in my Japanese class, which helped me to translate the main gist for my friend (yay). 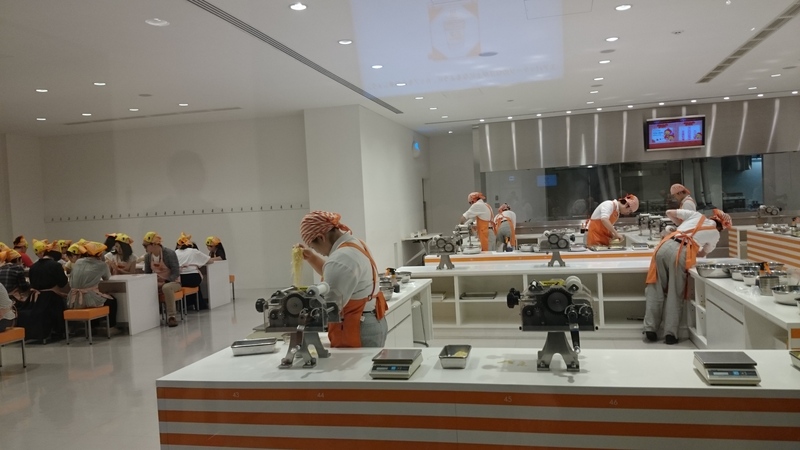 Aside from the gift shop, which is chock-full of Nissin souvenirs and special-edition instant ramen, the main attraction is the “factory“, a hall where you can “make” your own customized cup noodles. Because of the popularity, you have to reserve a specific entrance time for the hall when you buy an entry ticket, and it seems that they book out pretty quickly. 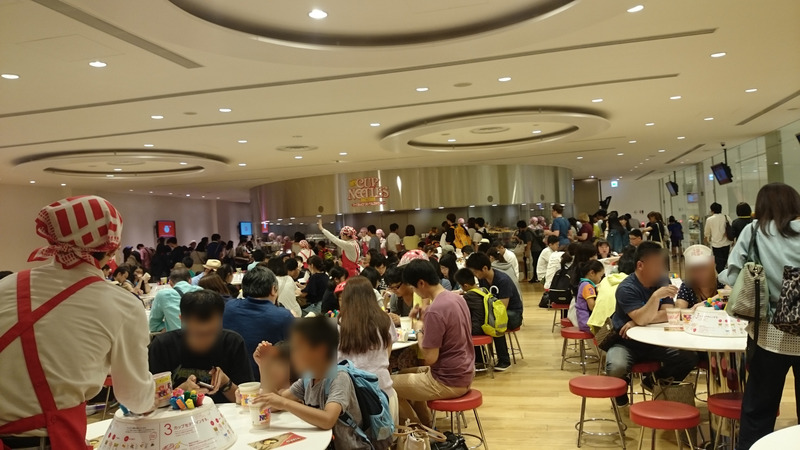 Once inside the hall, you buy an empty cup noodles cup from a vending machine and then are escorted to an empty spot in the hall by staff whose crowd-control skills are extremely impressive. At the table, you use the markers provided to decorate your cup as you wish. After that, you take your cup up to the assembly station. The staff pretty much handle the whole process (for obvious reasons), but you get to turn a crank the puts the instant dry noodles into the cup, select the soup flavour (plain, seafood, chili tomato, or curry) and toppings, and then watch as the cup is sealed and shrink wrapped. The last step is to pump air into the plastic storage pouch for your custom cup. 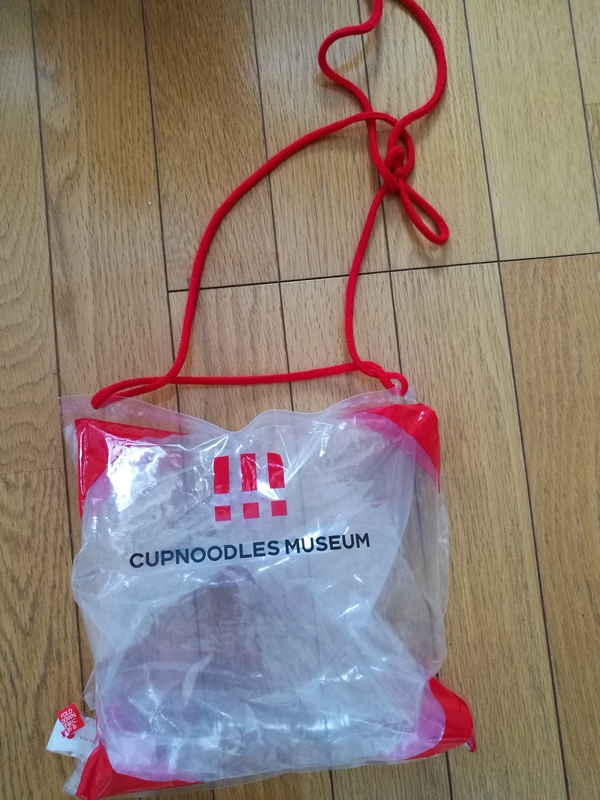 You’ll see people wearing these pouches all around the tourist areas of Yokohama, so you can tell who visited that day! In a recent post, I mentioned the Japanese word Ｙシャツ (roughly pronounced “why shahtsu”), which comes from “white shirt” and means a man’s dress shirt. This reminded me of a blog post that highlights a few other words that came from English—but the meanings in the two languages don’t quite correspond. The words are written in katakana, the phonetic writing system that’s generally used for words of non-Japanese origin. Another word that I would add is メモ (memo). In English, I think that “memo” has a more specific meaning of an inter-office announcement or official statement, whereas in Japanese, it means any note in general. So if you say you’re taking or writing a memo, it just means writing a note or reminder for yourself or another person. And finally, I just have to mention again my favourite Japanese word ホッチキス, which comes from Hotchkiss. It means “stapler”, named for an early stapler company. Here’s one for the bureaucracy file. In 2015, Japan implemented a national registry number system called マイナンバー (mai nambā – that is, My Number). It’s sort of like a social security or social insurance number, but it seems like so far it’s mostly just used as a tax ID number. It can also be used for getting a copy of your ward registry. Since it has a picture, it’s an official government ID card. Like many (most?) people, I didn’t realize that the My Number card has an expiry date. As a foreigner, my card expires at the same time as my visa. I’ve renewed my visa on time of course, but didn’t realize about My Number until a year and a half later. Oops. Fortunately it wasn’t a big deal since the number itself was still active; just the card had to be reissued at our ward office. On my first trip to the ward office, I had to fill out a form with my name, address, birth date, and explanation for renewing the card. The government official very kindly helped me write that part. I also had to bring along a photo for the new card, taken at one of the many convenient photo booths found in any Japanese city. I was then told that the process was done for the moment – I just needed to wait about a month to receive a notification in the mail when my new card would be ready to pick up. I was pleasantly surprised at how quick and easy the process was, but then I got a call later that day: the official who helped me had neglected to make a copy of my residence card while I was at the office. Luckily, my hubby was allowed to just drop by with my residence card on his way to work the next day, which he kindly did on my behalf. So, I waited a month and received my notification postcard. It instructed me to call to make appointment. I also had to bring along a form with my name, address, and two passwords for my My Number account. I had to wait a bit at the ward office, but when it was my turn, the official took my new form and filled out another form herself, copying from what I wrote. Then I filled out the same form again from my first visit, with my name, address, and reason for getting a new card. Then, on another form, I wrote down my passwords again. Next, it was time to pay. First, I gave the official at the desk 200 yen in cash. Then I had to buy stamps from a vending machine to the sum of 800 yen. (This is a common way that payments for government services are handled.) I was instructed to buy one 50 yen and one 750 yen stamp, but the machine was sold out of 750, so I had to get one each of 350 and 400 instead. Then I waited about 20 minutes to be called to the desk again. I handed over my stamps and then typed each of the passwords twice into a computer. (Remember, I had also written these twice on two separate forms.) The last step was to sign another paper, and then I finally received my new card. I’ll get to do it again in a year and a half, hurray!